When Kosmo Foto announced its first film, Kosmo Foto Mono, last year I was among the first to preorder. Stephen Dowling, the man behind Kosmo Foto, has been a longtime friend to film photography and to this blog. I was very happy to support his venture and try his film! This ISO 100 black-and-white negative film is an existing emulsion, repackaged for Kosmo Foto. Dowling hasn’t been forthcoming about what film this is, except to say that he’s shot it for years and loves it. My Olympus XA was sitting on my desk when my order arrived, so I loaded a roll right into it. And then Margaret and I spent the following weekend in Chicago. The XA spent the whole weekend in my inside coat pocket — except when I got it out to shoot a scene. I see why Dowling loves this film: it gives a wonderful classic black-and-white look. This gray, dim weekend presented quite a challenge for the XA on ISO 100 film. I have a pretty steady hand and can dip down to around 1/15 sec. handheld without camera shake — but even at a shutter speed that slow the widest I opened that lens was f/4. My in-focus patches were correspondingly shallow. To compensate, I mostly chose distant subjects and focused at infinity. It worked out. Just look at all that great contrast! And while the film’s grain is detectable, it’s not pronounced. I felt emboldened to try some street photography. 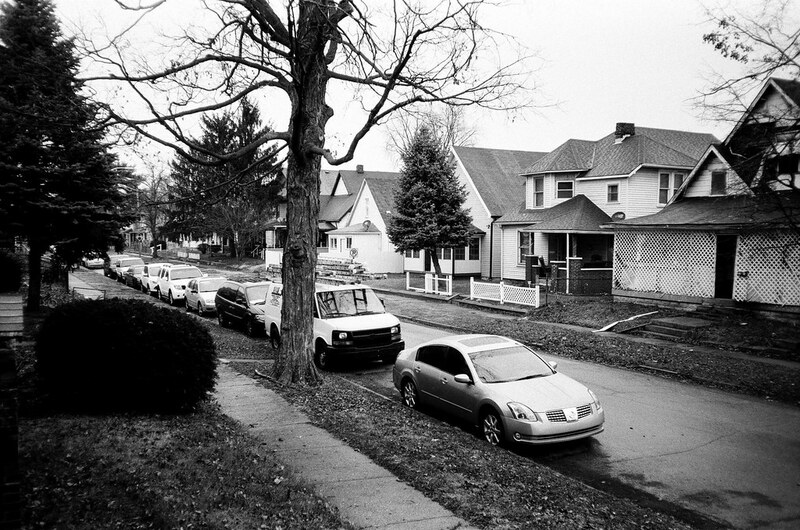 I use that term loosely: I was on the street, there were people, I made some photographs. 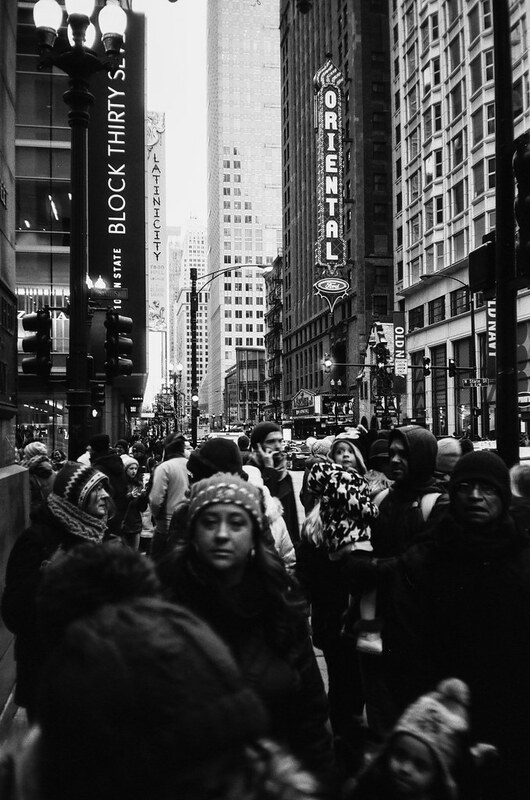 I focused on the built environment and waited until the arrangement of people on the street was not uninteresting. This is my favorite Chicago street shot. I wanted the fabulous Oriental Theater sign in my frame, and aligned it roughly on a vertical rule-of-thirds line. Then I put the crowd’s faces on a horizontal rule-of-thirds line. It really worked out. 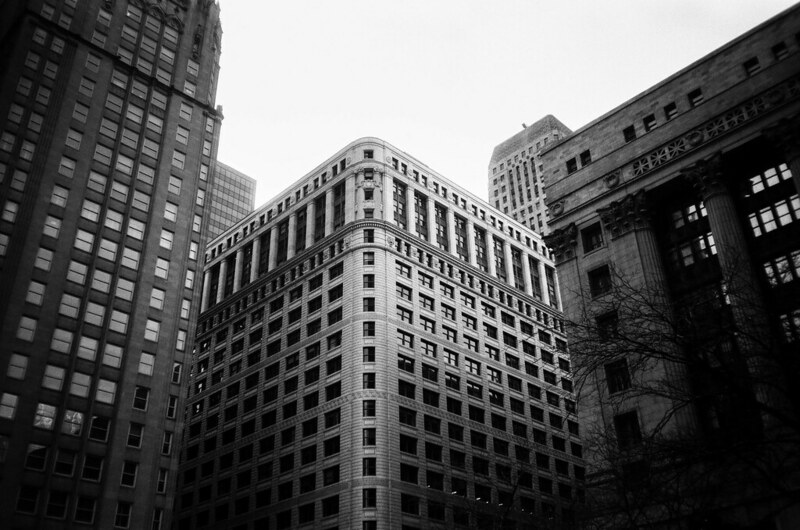 I shot about half of this 36-exposure roll in Chicago, and the rest closer to home. The grounds of the former Central State Hospital for the Insane in Indianapolis is near where I go to church. 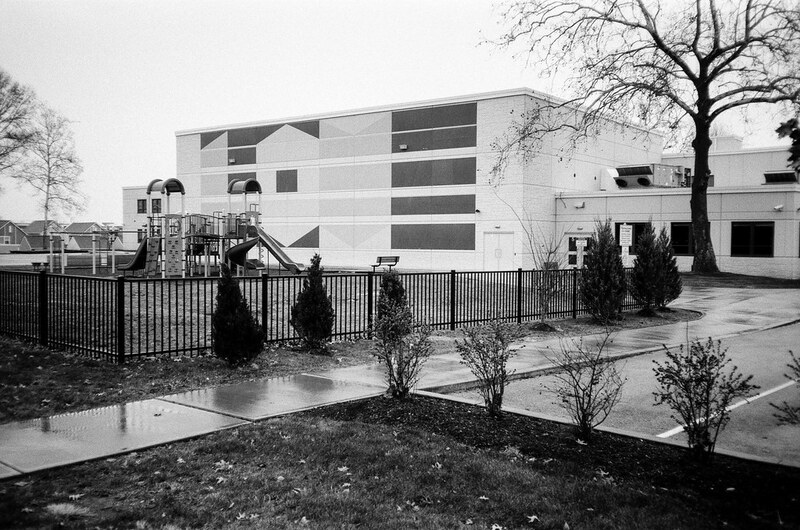 The Christel House Academy charter school was built on the grounds a few years ago. 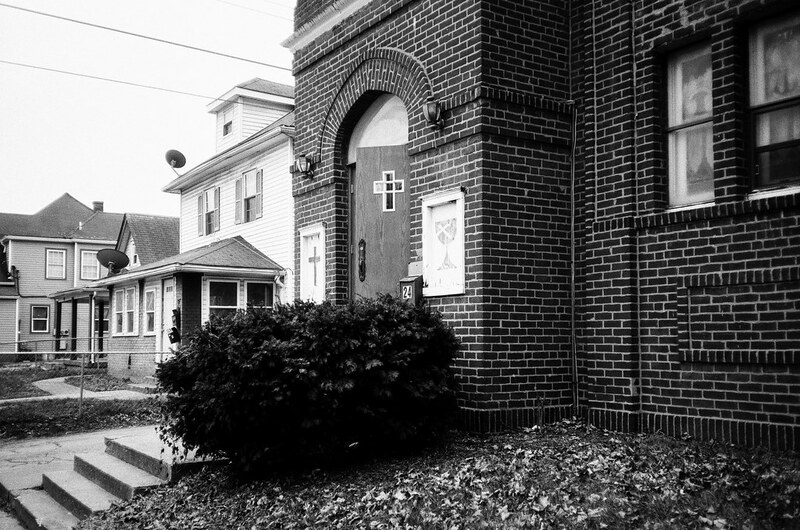 The mural on the wall reads LOVE, but the film had trouble picking up the V and especially the E.
Here’s my church, West Park Christian Church, in its context: an Indianapolis neighborhood built around the turn of the 20th century. The church building is steps off the National Road. Looking out from the church building’s steps, here’s Addison Street. Indianapolis’s old neighborhoods all have names; this one’s is Hawthorne. Where Hawthorne is a working-class neighborhood, you’ll find central Indiana’s well-to-do in the village of Zionsville. 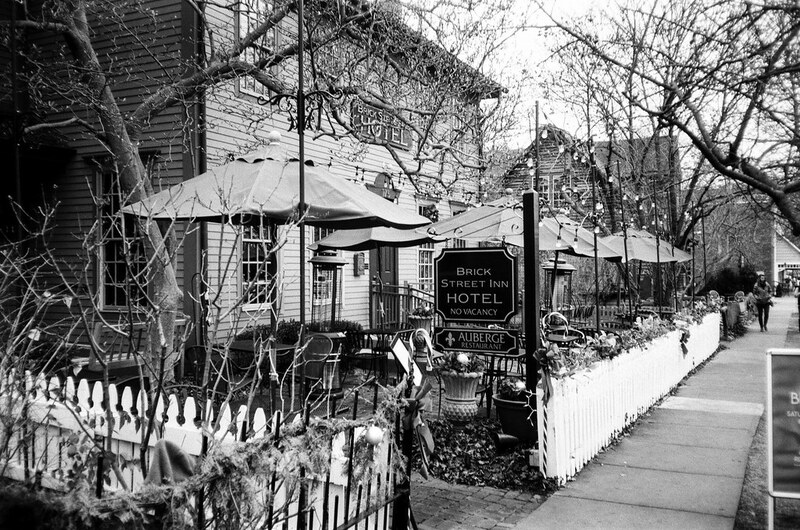 Its charming main street is lined with little shops and restaurants and even one little hotel. 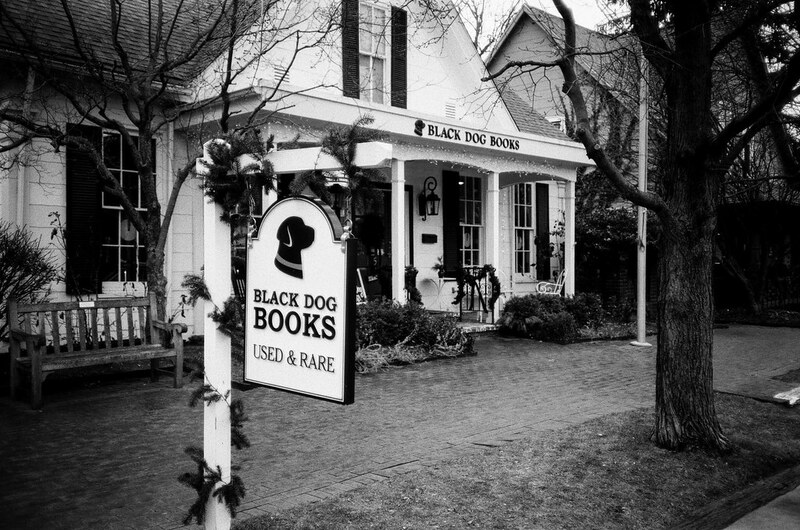 Any time I’m in the village with a camera I photograph the Black Dog Books sign. Shooting in poor light as I did, Kosmo Foto Mono rendered moderately lit areas well but tended to lose detail in the shadows. I’d like to shoot my next roll on a bright day to see how it behaves. Other old-school contrasty films I’ve shot, such as Fomapan 100 and Kentmere 100, have tended to blow out highlights in bright light. I’ve learned to meter for the highlights to compensate. That’s what I’ll try with Kosmo Foto Mono, too. I look forward to it. I don’t know that much about film or photography Jim, but I do know that I enjoy your photos …. especially the black and white ones like these. Thank you. I’m happy you enjoy my photos, Nancy! Although you’re right that the shadows get a bit muddy at times, I love the look of this film; it’s so rich and saturated! You are sorely tempting me to return to film with this post, sir. PS: “I was on the street, there were people, I made some photographs.” I believe with that you nailed the three requirements for being a street photographer. :) Great images — all of them! Oh, you could just dabble in film occasionally, you know! Just for fun. You’re very persuasive — and absolutely right. Maybe I’ll fire up the ol’ ME Super and see what happens. That little German building next to the theater has fascinated me for years, wondering how something that small could exist on land that valuable. I see that at some point they have preserved the façade, but built a tower behind it. Looks to be reasonably well done. You know your Chicago! Yes, that shot was Daley Plaza. I didn’t really notice the little building next to the theater, and now next time I’m there I’ll look for it. These turned out really nicely. That’s inspiring work! I’ve been working at getting better results from 100-speed film for a while now. I like the slower films partly because they are similar to what was available to photographers when a lot of my old cameras were new. The strong blacks and over-all dark tones are part of the attraction and also part of the challenge in regard to getting the right balance of contrast and details in both highlights and shadows. That is nothing new, really; users of Plus-X faced the same opportunities and challenges. Some of the current strategies include shooting the 100-speed film at a stop slower than the rated box speed and applying special processing techniques including stand development and staining developers. My benchmarks for such efforts are the results provided by Fuji Acros and TMAX 100 which can be shot at box speed and give great tonal depth and fine grain. I like the challenge of getting close to those results with cheaper films like Kentmere and Fomapan, though the amount of experimentation required is making the price advantage somewhat less. Why thank you so much Mike for saying so! The ISO 100 films are quite useful in older cameras. They’re a good match for the lower top shutter speeds they have (compared to later cameras). And films with a traditional grain structure seem to work well with the older lens designs, especially when they lack coating. I pre-ordered this as well although i have yet to shoot a roll. I split the maximum order of 10 with a good friend of mine and he informed me that if you peel the label back you can see a foma 100 logo. All of the examples i’ve seen so far seem to support this. I think your highlights were forgiving and shadows dense because of the way the XA meters. I’ve noticed they are very highlight priority cameras in metering. Even with the slight disappointment that i spent close to 6$ on 4$ film i don’t regret it. The artwork is stellar and we need people to love film for it to survive. Will i buy more? We’ll see. I’ll be shooting my first roll this weekend. Great work Jim! I love seeing Chicago in black and white. Have you tried Kodak Double X? It’s 35mm bw cine film that kodak still makes today. It has buckets of character and gives your shots a true silver screen look. In fact, if your near fishers soon drop me a line, i’ll give you a roll. I would enjoy hearing your thoughts and review. I hadn’t considered the XA’s metering in the equation here. I think next time I shoot some of this film I’ll use my Pentax ME or my Spotmatic F and see how things differ. Awesome! I’ve been reading your blog for 3 years, i don’t know how I’ve missed this. Sneaked it right by you, I did! Excellent pictures! Reminds me of the dark-style in Life Magazine. I especially enjoy seeing the Oriental blade sign. There were plans at one time to destroy the Chicago and Oriental. They found a new use for big-dollar shows. That film seems to be unavailable or sold out. I didn’t know those theaters were at risk. But now that I know I guess I’m not surprised! I think your work here is very, very good. I am not so much a fan of this film though. These same shots on TMAX or Tri-X would be stunning! I think T-Max would have been a wonderful choice here. The more I use T-Max the more I think it needs to be my primary b/w. A lovely set of photos. 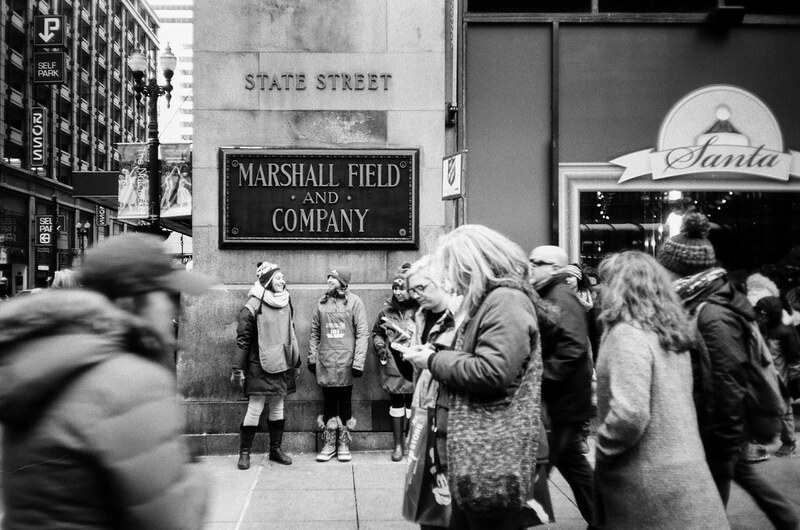 My favorite is the Marshall Field and Company sign, it’s such a beautiful street scene. I’m currently trying to finish my first roll of Kosmo Foto, I’ll try your tip and expose for the highlights for the rest of the roll. 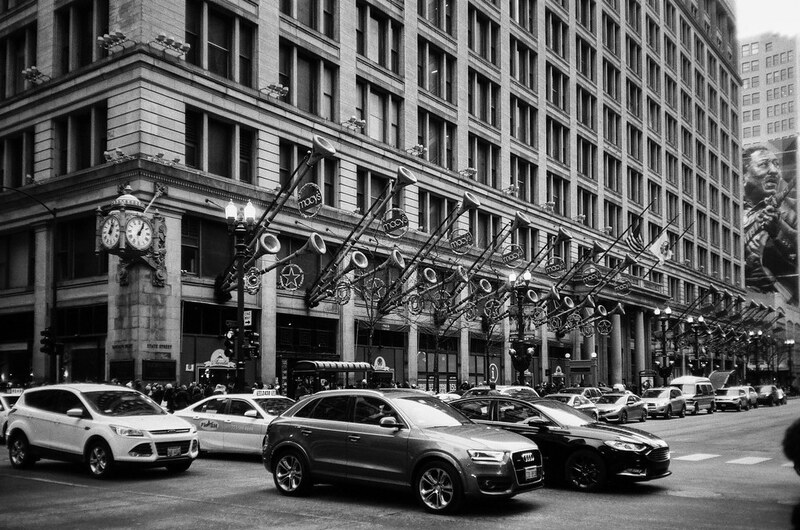 I really love the Marshall Field shot as well, because the sign seriously anchors the photograph amid all the human activity. Thanks for the wonderful review of the film. I loved the images as well. 1,3 and 4 are fantastic. Thanks for sharing. Thank you! I was pretty happy with how the Chicago shots turned out. I think I agree with Joshua Fast, here. Looking at the photos it looks like Fomapan 100 to me. I don’t see the point in repackaging someone else’s film and marking it up. At least Japan Camera Hunter brought back a stock from the past got it manufactured again, AND has been quite transparent about the whole thing. I’m a big fan of Stephen Dowling and his site, but I’m not buying into his repackaged film. To be fair, Stephen has always said this is an existing emulsion. He just never said which one. I’ll have to compare this film to the Fomapan 100 I’ve shot in the past.